The Future of DJ Media Players Right Here. Right Now. The Denon DJ SC5000 Prime represents a real paradigm shift in DJ Technology, right here, right now. This (DJ Mag) Tech Award winning digital DJ Media Player has a 7”, high-definition touchscreen that enables multi-touch gestures for the ultimate in latency-free, tactile track navigation, load and playback. The SC5000 is also the world’s first DJ Player capable of on-board music file analysis, an innovative standalone, dual-layer deck capability and 8 performance pads for the ultimate in creative DJ expression. Powered by a dedicated, multi-core internal processor, the SC5000 runs ‘Engine Prime.’ This latest version of Denon DJ’s music librarian software is onboard the unit, offering you super-fast collection track load, navigation and search, so you can be at your creative best. The SC5000 doesn’t stand in the way of your creativity — it works with you and gets out of the way! Unique on the SC5000 is its bank of eight multifunction performance pads that deliver unprecedented creative expression for your hot-cues, loops, slices and roll playback – all safely locked down by the SC5000’s insanely accurate beatgrid analysis. 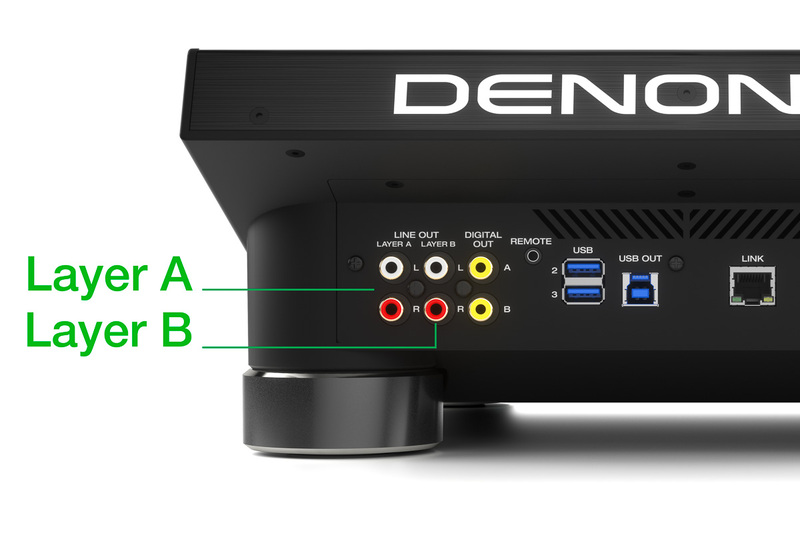 Up to four SC5000 Players can be LAN networked for synchronized data transfer between units, plus you get enhanced BPM and FX possibilities using ‘Engine Connect’ protocol to work with Denon DJ’s X1800 Prime, 4-Channel mixer. Once a media source is inserted, the SC5000 remembers any previously entered DJ preferences, ensuring the unit recalls every one of your performance preferences and settings. This includes any previously performed track cue points, loop regions, playback history, preparation folders and of course any live, on-the-fly, track analysis. Visual customization is highlighted by your choice of main primary colors for the SC5000 Prime’s 8-inch (touch-capacitive) jog-wheel LEDs, in addition to using your own DJ brand logo or selected track artwork on the beautiful central display. On the SC5000 touchscreen, elegant pinch ‘n zoom in/out of the big, beautiful track waveforms brings you to the pinnacle of musical timeline visualization. The SC5000’s unique dual-deck playback facility makes the unit literally ‘2-decks-in-1,’ and with dedicated (digital and analog) outputs for each layer, brings you imagination-driven, music playback possibilities. The audio outputs are 24-bit/96kHz for the very highest sound quality, and of course the SC5000 Prime plays all compressed and uncompressed audio file formats, including FLAC, ALAC and WAV. The Denon DJ SC5000 Prime returns you to ‘The Original Artform,’ bringing back DJ passion and creativity alongside performance transparency. Engage in a new visual performance workflow with the SC5000’s amazing, latency-free HD touchscreen. It’s easy to navigate through crates, playlists and your up-next ‘Preparation Folder’ tracks, while organizing your music by category and getting lightning-fast search results using the on-screen, alphanumeric keyboard. All your vital DJ performance info is viewable, such as BPM, musical key, loop-lengths and bar/beat counter etc. Plus with the ‘swipe-right to load’ feature, dropping tracks into the mix is a totally perfect experience. 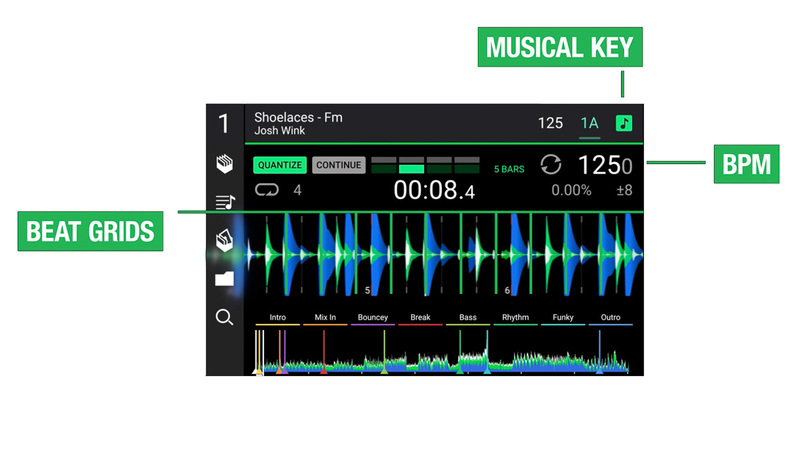 The large, tri-colored (frequency split) waveform can be viewed zoomed in or out with a finger pinch-gesture and shows clearly that essential beatgrid positioning throughout the track. Add this to the full-track waveform overview, for both layers (A & B), and utilize the needle-drop touchstrip to jump to any position in your song. Two players in one standalone unit! The SC5000 Prime is armed with not one, but two actual deck layers, capable of beatgrid locked synchronization. The rear of the SC5000 has dedicated audio outputs for these layers, offering some incredible options for creative and forward-thinking DJs – mix and match between, acapella’s, instrumentals and beats, all on one single SC5000 Prime – the possibilities are endless! At the center of the SC5000’s highly-responsive and touch-capacitive 8-inch jogwheel is a high-definition, circular screen. Each time a track is loaded to the player that contains album or track artwork, it’s displayed in this stunningly beautiful central screen. 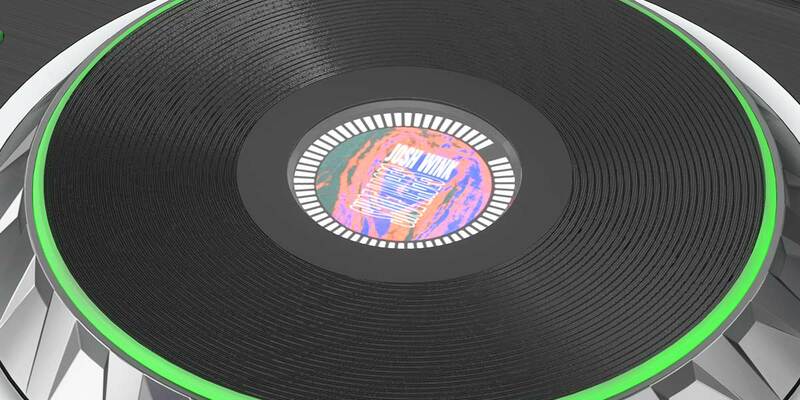 In addition, you can lock in your own custom DJ or club artwork, for the ultimate in Artist branding customization. Of course, all other important DJ data such as deck status, time duration and loop lengths are displayed too. The SC5000 unit has eight highly tactile and responsive performance pads, which give you the freedom and confidence to perform astounding audio tricks, cut-up and remix tracks and reinterpret your music collection using this single media player alone. 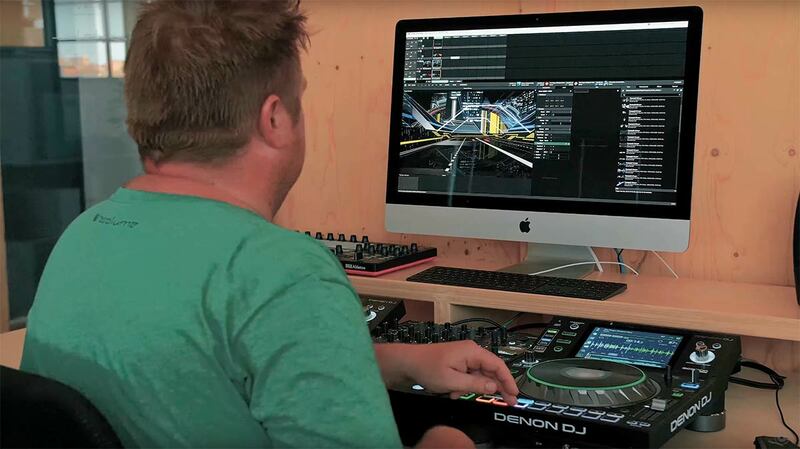 With standalone Hot-Cue, Loop, Roll and Slicer control, creative DJ’ing has just entered a whole new dimension! 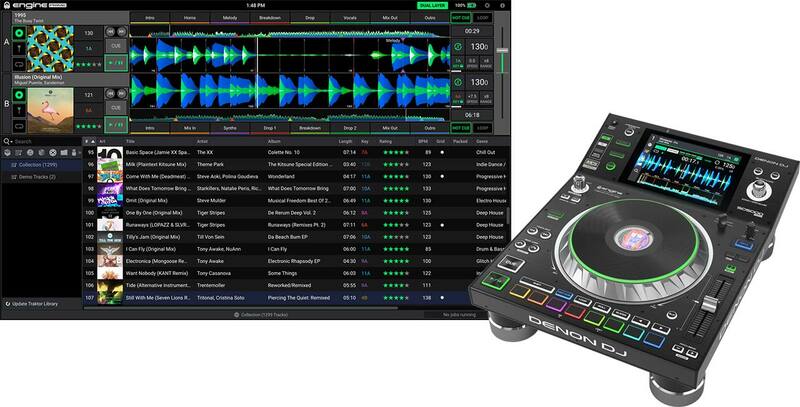 Engine Prime is Denon DJ’s powerful Music Analysis and Management software that helps you organize, categorize and import your music, either fully integrated from iTunes, Serato and NI Traktor collections (including hot cues and loop info) or via drag ‘n drop from existing music folders. Want to import your Rekordbox music? No problem, simply insert your drive and the SC5000 will import that library too. Completely reimagined, Engine Prime enables offline music performance attributes such as hot-cues and loop regions (both of which can be named individually) to be entered manually or on-the–fly, plus beatgrid editing and track auditioning too. Your music collection is then easily and quickly exported to either USB drives or SD card for creative standalone performance on the SC5000 Prime. 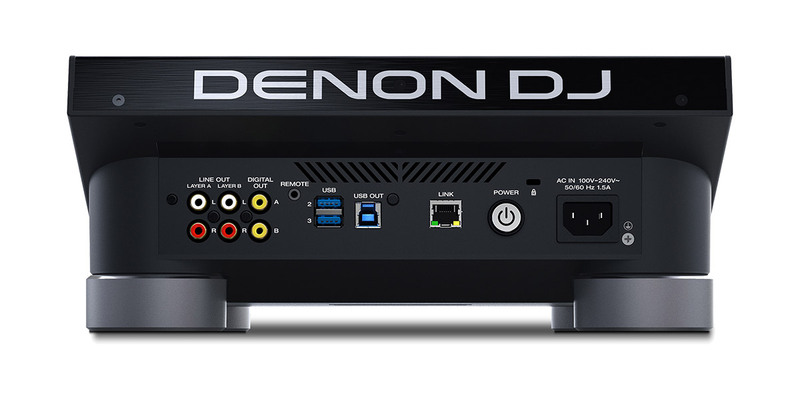 When up to four SC5000 units are connected directly via LAN to Denon DJ’s X1800 4-channel digital mixer, additional communication and performance enhancements come into play. ‘Currently playing’ track tempo data is transmitted, enabling the ‘Engine Connect’ protocol to give you bit-accurate control over the X1800’s tempo-based FX and the ability for uber-fast music transfer across the network too. 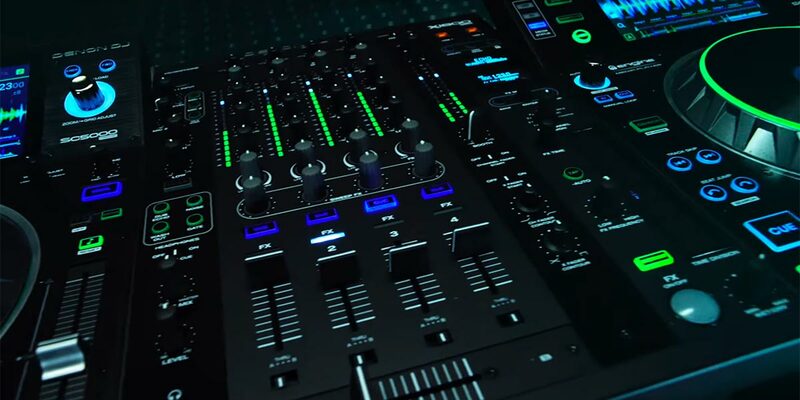 In addition, via the networked SC5000 players, the X1800 mixer uses its StagelinQ connection to control AV, video and lighting effects, working seamlessly with SoundSwitch, Resolume and Timecode software. The SC5000 Prime is the world’s first DJ media player capable of internal analysis of a media source’s music files, within the unit itself (and without the need of any computer pre-preparation). Simply insert your drive, load up a track, and the SC5000 will quickly and accurately analyze beatgrids, musical key, BPM, track artwork and all other metadata within seconds. You can instantly cue and play your track while this (once-only) analysis is happening in the back ground too – so there’s no delays to getting ‘in-the-mix’!